The main slipway of the island is that of Santa Marina where a touristic port is also situated; on the south-western side, instead, there is the Rinella slipway. The whole island is connected by comfortable rotating roads, which intertwine along the slopes of the mountains, crossing lavic flows of amazing shapes. The best way to visit the island is surely to hire a scooter or a car, anyhow during the summer period an efficient bus service goes on till late evening. The commune of Santa Marina rises upon the slopes of the Fossa delle Felci, where a huge crater covered with shrubby vegetation mainly composed of ferns, is visible. As soon as you arrive to Santa Marina it is possible to admire the wonderful 18th – century church with its characteristic bell towers. This zone is the most busy point of the whole island because full of small shops and locations, which in the evening become crowded for nocturnal amusement. 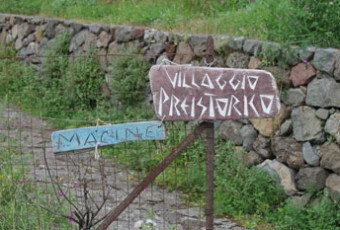 At the western side of the land, about 100 metres far from Santa Marina’s ring-road, in a locality of Serro dell’Acqua, it is possible to go through a path which leads, through olive and fruit trees vegetation, to Saracen caves, excavated from tuff, and hidden by dense vegetation, used as a refuge to escape from cruel barbarities committed by Saracens around 650 A. D.
The caves, fascinating for their morphologic structure, are composed by different communicating rooms, inside which, even today, cross cuts and a number of votive signs are visible. Moving down the road towards south, around 2 km away, you reach Lingua, a small village of fishers, so peculiar for its beach with pebbles, which reflects itself in crystal clear water. During your walk linger to admire, in Vallone Zappini locality, the 18th – century stone bridge, which was a part of the antique road. Lingua extends along the north – eastern coast of the island. A terrace above the sea leads, through well-known for their good food locations, to a small lake of salty water separated from the sea by a thin strip of ground, once part of saline, from which the island took name. There are still visible some of the basins, dating back to the Greek period of the III b. C.
The place, headed by a picturesque light-house, is a natural reserve and represents an ideal place for the fans of bird watching who, during migration periods, can admire suggestive views. 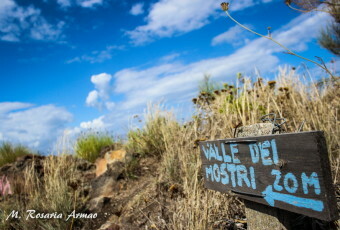 From Santa Marina, Lingua fraction and Val di Chiesa, for the fans of trekking, in 2/3 hours, it is possible to reach the Fossa delle Felci, an old volcanic crater, from which you can admire all other islands, and even Etna. The pretty village of Malfa, whose name probably derives from the Amalfitans emigrated during the 12th century, is situated on the northern coast of the island, in the valley between Monte Rivi and Monte Porri. The dwellings, of characteristic white colour, are spread along a slope which slides towards the sea. At the village there are a small beach with pebbles of lavic boulders and a small port called Scario Galera, partially repaired and suitable for boats of small fishing. In the main square there is the Saint Anna’s church, going back to the 18th century; inside it contains a number of paintings and sculptures: Natività della Vergine of 1742, Madonna del Rosario of the 11th century, Madonna della Guardia of the 20th century, the wooden sculpture representing the Holy Heart of 1925, the sculpture of Saint Anna with Madonna and Bambino of the 20th century, and the last sculpture with the effigy of San Giuseppe with Jesus. The adjacent zone is full of locations and small shops, the square’s floor is decorated with the wind rose, which refers to the link between these isles and the winds ruling them. The Pollara fraction rises from the rests of an antique crater partially collapsed, leaving as an evidence of its existence a stack which, from the sea, preserves millenary secrets. The village is situated around the Chiesa Patronale di Sant’Onofrio, built in 1853, where the statue of Immacolata of Sant’Onofrio, some of the paintings dedicated to Madonna, and the original floor, are kept. 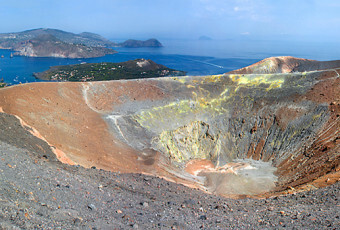 When Pollara is mentioned, it is hard not to link it to Massimo Troisi, who once fallen in love with those places, decided to set there some of the most suggestive scenes of his last film, Il Postino (The Postman), which gave a remarkable resonance to the extraordinary landscapes of Salina. The beach of Pollara, situated under the steep reef, shaped as an amphitheatre, with overhanging rock over the sea, is one of the most fascinating places of the whole Aeolians; at north there is the bay Balate closed by Perciato, a headland where stores and shelters, excavated in tuff, are visible. It is possible to reach the creek by a steep staircase which crosses the house of the Postman, where the namesake film was set. From this beach it is possible to admire the spectacular sunset, considered one of the most beautiful sunsets in the world. The sun is of a wonderful intense red colour, and acts as a setting for amazing natural attractions, just think about a stack, an arch in the foreground, and about the beautiful islands of Alicudi and Filicudi, in the background. The commune of Leni, called Lenoi by Greeks because of the containers where grapes was pressed, is situated between the two mountains and contains the fractions of Rinella and Val di Chiese, where the Santuario della Madonna del Terzito is located. This sanctuary arose from the ruins of a modest sacred building, realized by a hermit, who then placed an image representing the Virgin. In 1962 a farmer found an old painting of the Madonna among the ruins of the old building and, upon them a church was built. In the half of the 19th century the sanctuary underwent its first restoration, representing today the third church of the archipelago, and inside there is an 18th century canvas with the effigy of Madonna, depicted in the act of protection towards the isles, and a wooden statue representing Madonna with the same iconography of the antique painting found. Much more recent are the external modifications which brought to the creation of two bell towers, collocated at the sides of the Virgin’s statue, and to the amplification of the central nave. The small village of the fishers, Rinella, is situated along a steep valley, which leads directly to the sea. Suggestive, unique and charming, this place represents one of the most characteristic places of the whole island, where it is possible to visit a wonderful beach of black sand, of a half-moon shape, surmounted by caves excavated in the rock, which were used as a shelter for boats. The depths, low and sandy, are a paradise for the fans of snorkelling, who beyond the marine flora and fauna, can observe the volcanic activity consisting in phenomena called sconcquassi (upheavals), which are manifested with gas emanation and vapours from depths. In the village the second port of the island and a small port for boaters are situated.